Jen Ditkoff, Student Engagement and Information Fluency Librarian, and Heidi Herr Academic Liaison, Special Collections facilitated this week’s freshman orientation at the library and it was a blast! Things started off with a bang at “Fire & Ice” in the Macskey Room (BLC). This was an interactive session that gave new students the opportunity to ask questions about Special Collections and the library in general. We then hosted several tours of Milton S. Eisenhower Library and Brody Learning Commons, introducing students to the various aspects of the library building itself (e.g. stacks, GIS lab, special collections, Research Consultation Office, collaboration spaces, etc.) and how to access resources on and offline. At the conclusion of each tour, everybody got swag bags and a 4-port brick USB. Finally, we hosted a Special Collections Open House where students discovered and browsed books from medieval monsters, and poetry printed on pasta, to Hopkins history. Join us at the Athletic Circle on August 30th from 5:00 – 7:00 p.m. as Blue Jay Opening Day kicks-off the academic and athletic year. This university-wide “tailgate” features rides, games, a photobooth, DJ, giveaways, and opportunities to connect with campus and community resources. The library will have lots of great swag and answer your questions about how to become a research Jedi! Research in Focus: Freshman Fellows Information Session, 5:30-6:30 p.m. in the Macksey Room of BLC on M-level. 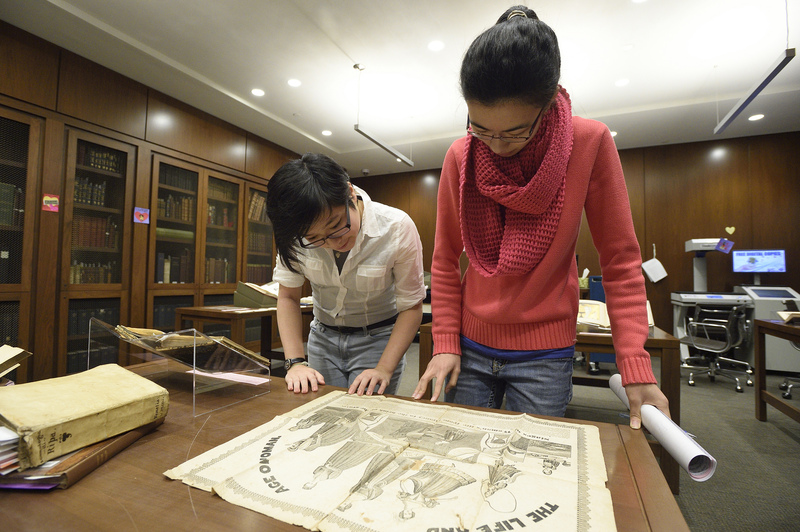 Special Collections Freshman Fellows is now accepting applications for a one-year fellowship exclusively for freshmen. You’ll get to do original research with awesome rare things, and you’ll be mentored by curatorial staff. Plus, you’ll get a stipend of $1,000 at the end of the fellowship! Past fellows have researched the relationship between fashion and feminism in the 19th century, explored the secret history of dorm life at Hopkins, and translated 16th-century Latin texts. For details, go to www.smore.com/pyt37. Why do we do all of this? Well, of course it’s because you’re a Blue Jay, but more importantly, to prepare you for your academic journey of online and offline research. And it’s all FREE! That’s right, free. If you use Borrow Direct, Illiad (Interlibrary Loan), and Eisenhower Express, you can obtain free books and have them delivered to your nearest JHU library. Did you know that there are librarians for every subject area? We encourage you to meet your subject librarian(s) at the onset of the semester, so that if you need help in the coming months, you know who to reach out to. Walk in any time into the Research Consultation Office on M-level in MSEL where a librarian is ready to answer your questions. Remember, we offer workshops throughout the academic year in order to keep you ahead of the game. Still have questions? Ask a librarian!